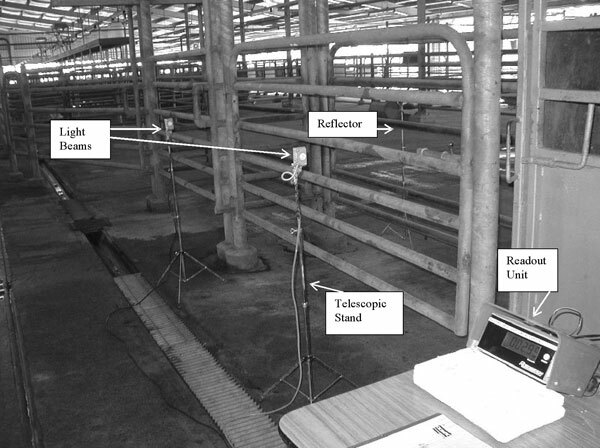 One of the many outcomes from the Beef Cooperative Research Centre (Beef CRC) has been the emergence of a simple objective measurement for cattle temperament, known as Flight Time. Flight Time has been proven to have a significant genetic relationship with meat tenderness & feedlot performance. This means that breeders can successfully use Flight Time to identify superior genetics for these traits. Many breeders select for temperament by simply culling aggressive or extremely nervous animals. This successfully identifies the worst animals and hopefully prevents the temperament of your herd from decreasing. What about selecting to improve the temperament of your herd & the related traits by identifying the best animals using Flight Time? An animal’s Flight Time is an electronic measure of the time it takes to cover approximately 2 metres after leaving the crush. Two light beams connected to a timing device (see Fig. 1) to collect the measurement. As the animal moves through the first light beam the timer is started. The timer is stopped when the animal breaks the second beam. It is recommended that Flight Time be measured at weaning to minimise the differences in animal handling. Animals are simply stopped in the crush before been released to exit freely through the timing device. More docile or better temperament animals will generally take a longer time to exit. How can we use Flight Time measurements? It is important that we understand genetic correlations when looking at how we can use Flight Time measurements for the selection of favourable meat quality & carcase traits. Genetic correlations indicate how strong the relationship is between two traits in regards to what we expect to be passed from parents to progeny. Genetic correlations range from -1.0 to 1.0 with zero indicating the two traits have no effect on each other. A high correlation (positive or negative) indicates that some of the genes controlling one trait also control the other. For example there is a strong positive correlation between weaning weight & birth weight, which means if you select for increased weaning weight in your herd, you will generally also increase birth weight. Table 1 shows the genetic correlations between Flight Time & a number of carcase & meat quality traits. The Beef CRC research shows that Flight Time has a strong relationship with striploin shear force (mechanical measurement of tenderness), MSA MQ4 score (Meat Standards Australia Meat Quality score), & MSA (Meat Standards Australia) tenderness score. This indicates that by selecting for longer flight time you can indirectly improve these traits. It also has a small relationship with retail beef yield & meat colour whilst having very little relationship with intramuscular fat percentage as shown by the near zero correlation. Table 1. Genetic relationships between flight time at weaning and carcase 7 meat quality traits of 3,594 Brahman, Belmont Red, & Santa Gertrudis animals. 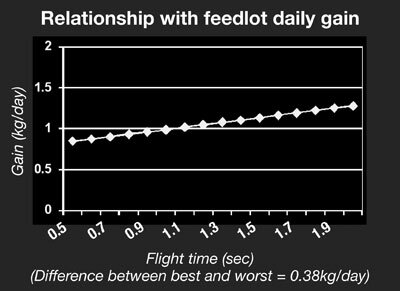 Flight Time has also been found to be a good indicator of feedlot performance. 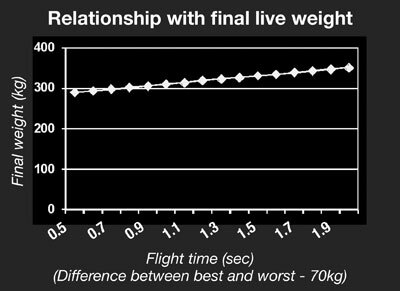 In an Beef CRC experiment using Brahman derived steers the more docile cattle or longer flight time cattle proved to be both heavier at final weight & also have a greater daily weight gain as shown in fig. 2 & 3. The difference between the heaviest & lightest steer at final weight was 70kg. Also the difference in weight gain between the highest & lowest was 0.38kg/day. Meat quality & feedlot performance are traits that are hard to change through selection. Flight Time has proven to be a simple objective measurement that can help us to identify the superior genetics for these traits. In order to better identify superior Flight Time genetics across the entire Brahman Breed all flight time measurements should ideally be recorded on the ABBA database. This will allow for the future development of a flight time Estimated Breeding Value (EBV) through Brahman GROUP BREEDPLAN. EBVs use the performance of all known relatives (through the pedigree) as well as the individual’s performance to better estimate the genetic value animals. In order for the development of a Flight Time EBV to commence sufficient industry records are required to combine with the existing Beef CRC data. As a breeder it would simply mean Flight Time testing as the same time as taking your weaning weights.